Some speaking habits have a lulling effect. There’s a difference between putting your listeners at ease and helping them nod off. You’re halfway through your big important presentation, and suddenly you notice that one of the executives you’re speaking to even seems to be gently nodding his head. Great, you must really be resonating! But then you realize he wasn’t nodding at all–he was nodding off. That’s right, your presentation is actually putting people to sleep. Noticing your listeners in the process of tuning you out can feel hugely embarrassing and stressful; wracked with sudden anxiety, now you need to get a hold of yourself and simultaneously get a hold of them. Here are a few reasons why your talk may have a sleep-inducing effect–and what you can do to avoid it. When your sentence length and pacing stay at the same level throughout your presentation, it produces a monotonous effect that can literally make your listeners feel sleepy. In a memorable scene from Jordan Peele’s 2017 movie Get Out, the protagonist is hypnotized by his girlfriend’s mother when she twirls a spoon around a teacup. Similarly, if you get into a rhythm where everything you say starts to sound the same, you may “hypnotize” your audience. This is especially likely if you tend to speak in long-winded sentences. So make sure you vary the length of your sentences, erring on the side of short phrases. 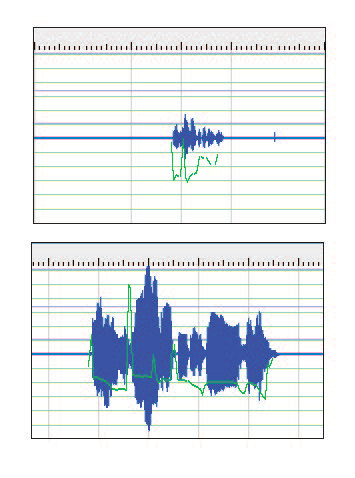 Another reason you may be causing your audience to nod off is because your sound pattern is “compressed” rather than “extended.” I recently worked with two speaking clients, one with a French accent and another with a Chinese accent. In both cases, I was certainly interested in what they were saying. I wasn’t tired, either. But with both clients, I found myself nodding off after just a few minutes–even though they both sounded very differently. What their speaking styles had in common, though, was a tightly compressed sound pattern. To see this visually, try out a speech visualization tool, like this one from Learning Fundamentals. In the first image at left, I am saying, “I’m so happy to be here” in a rapid, compressed pattern. Think of it like those vacuum sealers for packing clothes–you can pack more clothes in, but they’re flattened out. In the second image, I’m saying the same phrase, but I’m stretching out my vowels and extending the sound. To avoid inducing sleep, you want your speaking to look like the second image, not the first. It’s not about just speaking more slowly or rapidly, or changing your volume, though. When you stretch out your vowels, your sound pattern becomes more broadband and less monotone. Finally, your presentation might be boring your listeners to tears–or lulling them to sleep–because it doesn’t tell a story. You might’ve done lots of homework and have loads of great data points to share, but if you don’t frame your message as a narrative, you’re not going to engage your audience. I recently worked with a client who was preparing for an investor-relations presentation. He created a deck with 18 slides, each one bearing a chart and three bullet points. Plodding through those slides would put even the most dedicated analyst to sleep. Instead, I coached him on how he could turn all those metrics into a compelling story. If you’re able to tell a story that connects your key points in a meaningful way, you’re much less likely to lose your audience to an obvious snooze. Of course, you can’t stop everyone from tuning out during your talk–it’s not your fault if somebody pulled an all-nighter. But if you plan to avoid these potential pitfalls, you’ll be sure to see more heads nod in agreement than nod off.